Description: Herbs and spices in pots / containers are a very effective way for housewives or restaurants to always have fresh herbs available. A dish made with fresh spices and herbs is healthier and more tasty than the one made with spices from the store. For this reason more and more housewives prefer to have in the house or balcony, mini pots or containers with fresh herbs to use in different recipies. 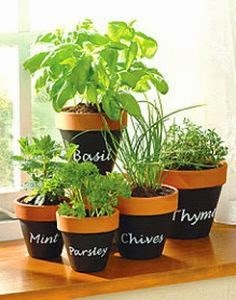 Among the most important herbs / spices that can be planted in pots are: oregano, parsley, tarragon, thyme, marjoram, dill, fennel, mint, basil, Rosemary, Sage, lavender, chervil (curly parsley), Mariela, Jackie, coriander, anise, chilies, etc. Pot herbs to be sold can be obtained directly from the seed or by purchasing small plants (which will be raised until they reach sizes of sale). 0 Response to " Herbs in a pot "